Warning this is a picture heavy post! 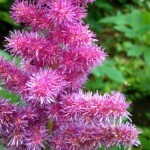 But if you are ready for some Spring color, read on. Things are moving so quickly now, and it seems as though I find a few new things blooming every day. 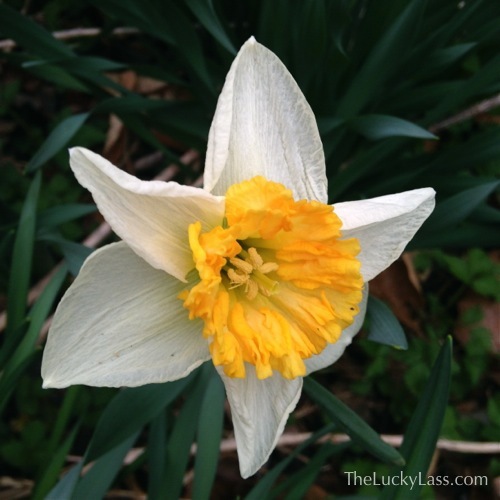 More Daffodils are opening up everyday- and I’ve counted at least nine different varieties so far. I’ve been taking notes on location, bloom time, height, and color in the hopes that I can figure out the varieties based on the tags and notes the previous owner left behind. 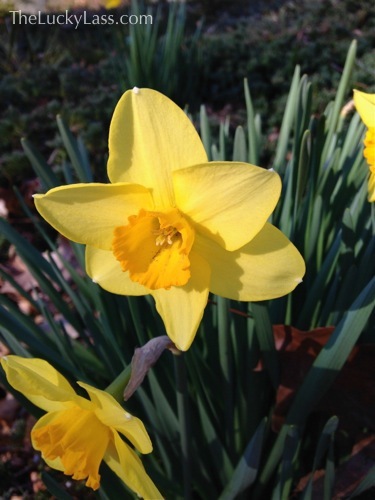 The daffodils that started blooming about two weeks ago, and until now would be considered ‘early’ Spring bloomers. 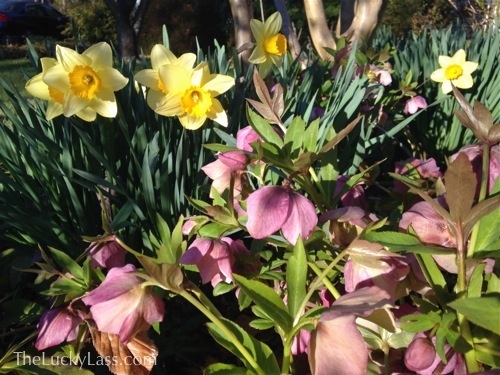 There is such a range of colors available in daffodils- all within the white-yellow-orange range, including some pinks and some ‘reds’. Although they aren’t a true bright red, it’s more of a deep orange red. 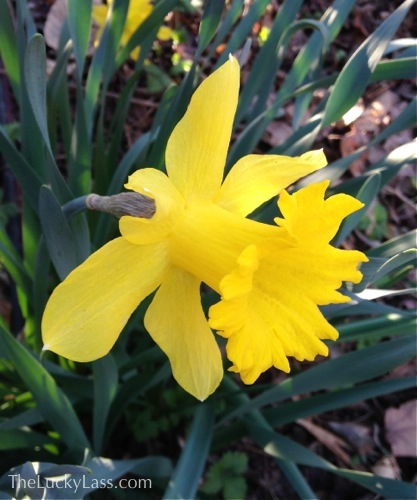 The head of this daffodil is miniature compared to it’s nearly 14″ height. 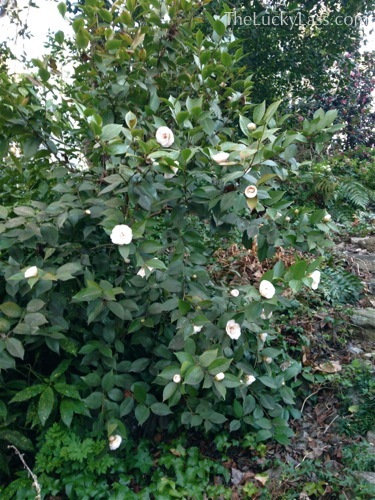 In mid-April, I’ll go around and take another round of notes- those will be the mid-Spring bloomers. 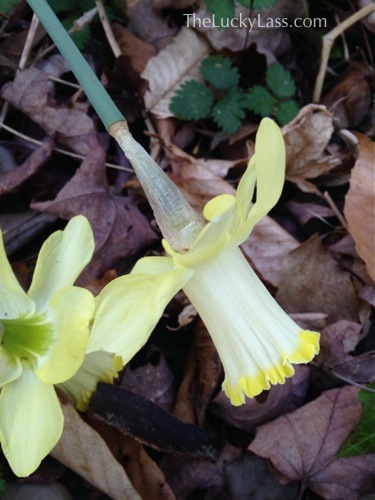 Some daffodils naturalize better than others (meaning they spread out and multiply on their own). 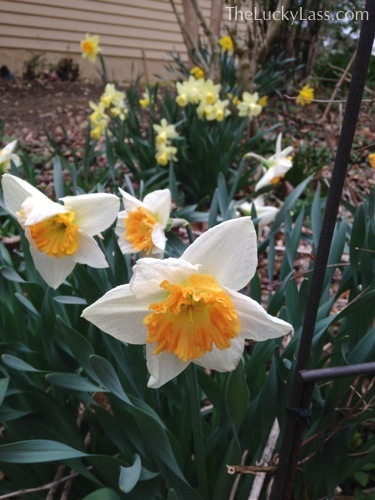 I have a plethora of these pale yellow daffodils. 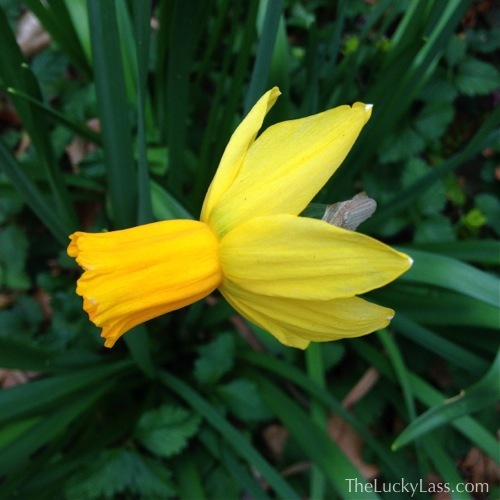 The trumpet on this Daffodil was enormous! 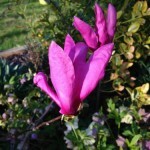 I wouldn’t mind adding a few more varieties though–in particular I am looking at the double flowered kind. These jonquils opened up just today! 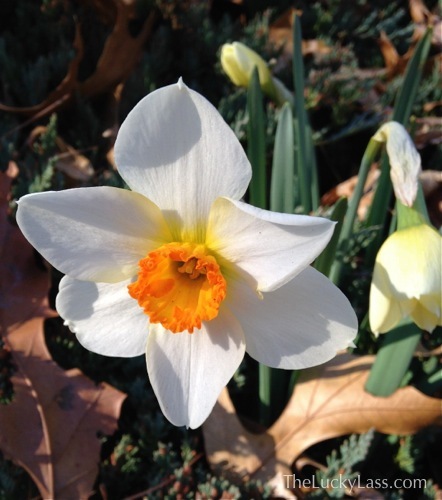 I did a little reading and found out that Narcissus is actually the genus name that encompasses Daffodils and jonquils. 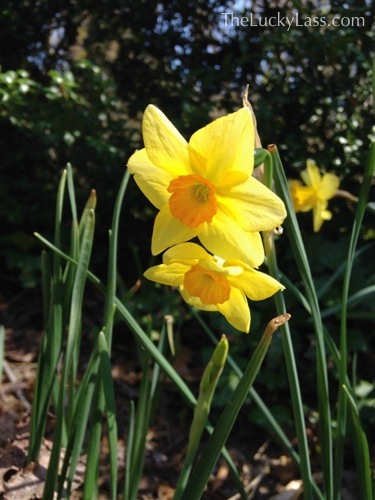 Technically, any plant that is in the genus Narcissus can be called by it’s common name- Daffodil. 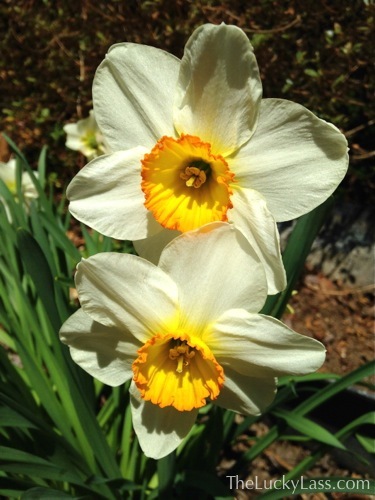 Jonquils are a specific type of Daffodil, usually characterized by thinner, tubular shaped leaves and multiple clusters of flowers on a single stalk. 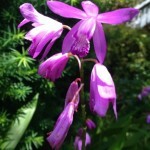 The one I have pictures has two blooming flowers on it currently. These are probably the brightest bloomers so far- a very loud yellow with a screaming orange cup. 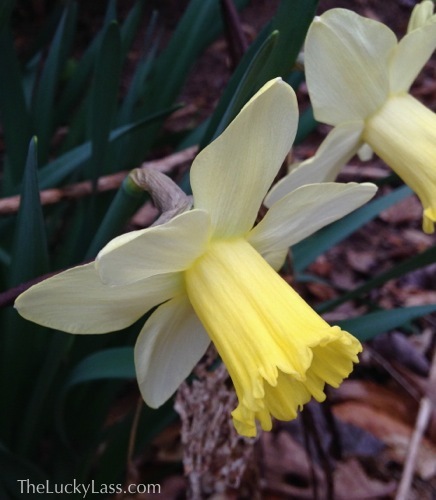 And finally this stunning frilly cupped Daffodil. 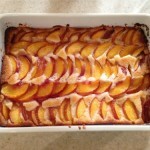 When it first opened, the cup was almost more peach colored than orange. 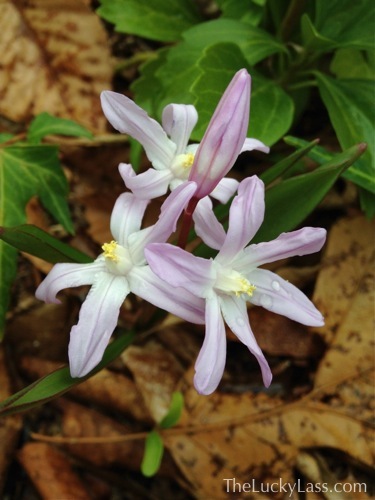 Another early bloomer that’s just about finished up now is the Squill. I’m not sure what variety it is, and I only have the one lonely bulb, but boy is it a pretty little thing! To give you an idea of the scale, the flowers are a little smaller than a crocus bloom. 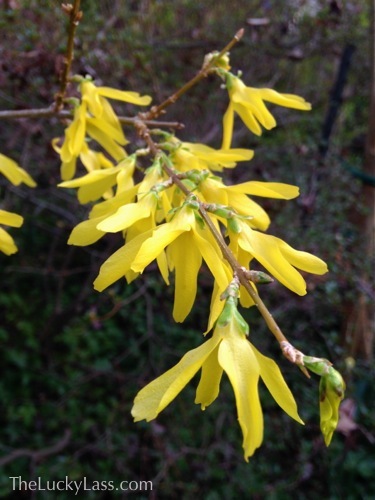 A lot of people use the Forsythia blooms as a natural clock–‘When the forsythia blooms, Spring is here’ and the like. Mine finally opened up just this week, but I think they don’t open as early or as much since they are located in part-shade. 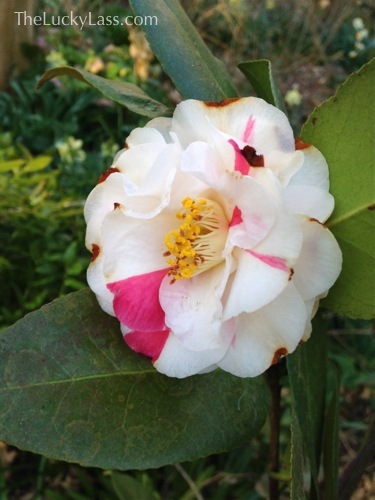 Forsythia isn’t the only early flowering bush. 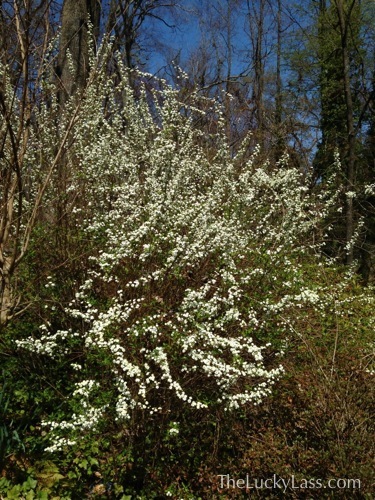 I have three wonderfully sized Bridal Veil Spirea bushes that are so cheerful with their white spires. 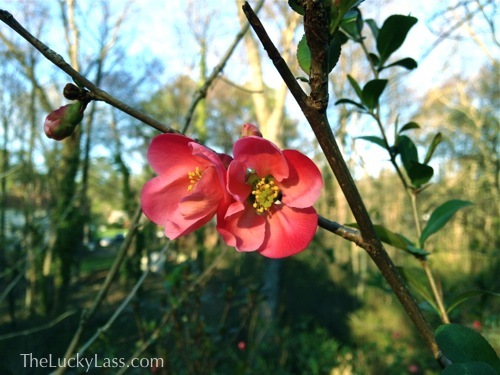 The Flowering Quince just started blooming as well. 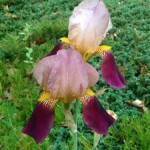 It’s not quite as covered with blossoms, but has a knock-out color. 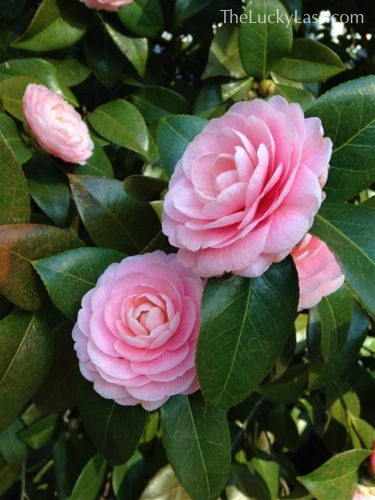 The Pink Camellia by the front stairs has opened up her beautiful rosettes. 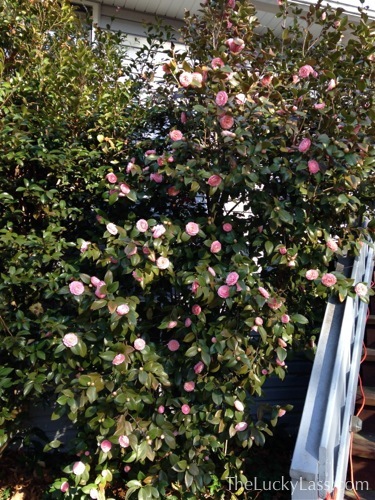 And the other Camellias are just getting started too! Too bad a lot of the buds have frost burns. 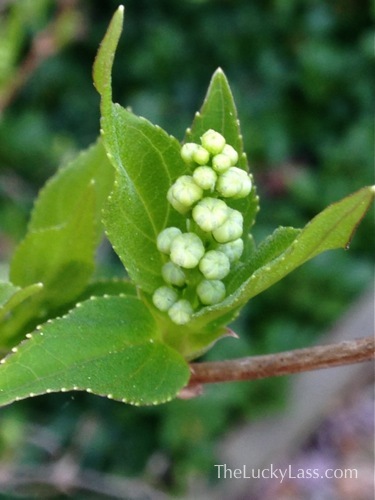 The Slender Deutzia has also set it’s buds- it will start blooming in a couple of weeks. 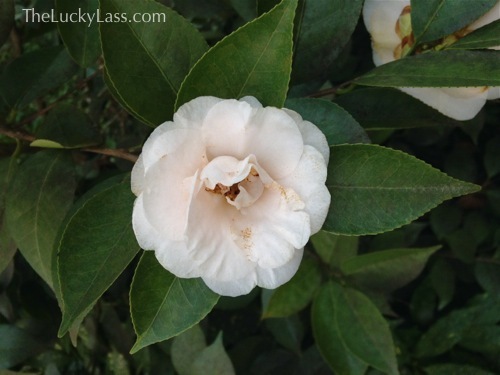 I have noticed some of the azaleas starting to set their buds, but it will be nearly a month before they really get going. 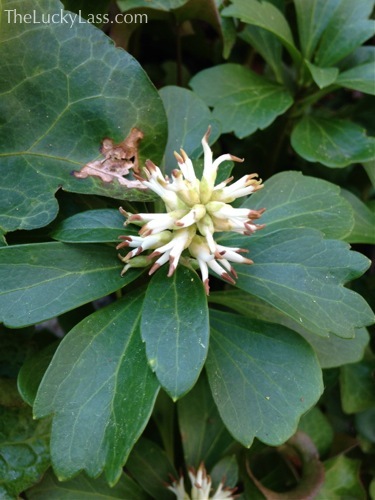 Even the Pachysandra is blooming now! I think they look like little tentacled claws. 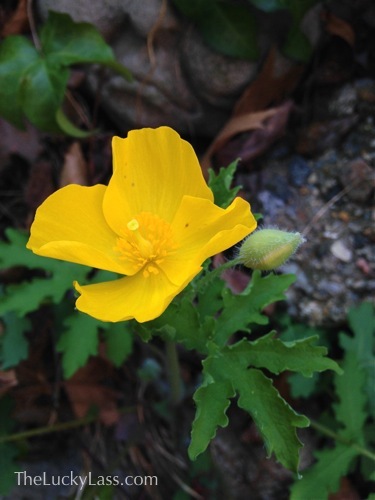 The Celandine poppies are quick to grow and pop open. These smaller yellow flowers are very cheerful! Not everything in the garden is yellow or white– there’s plenty of blues, violets, and pinks! 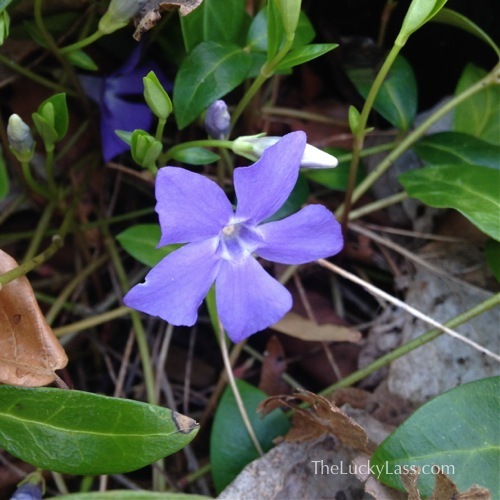 The Periwinkle is in bloom now. 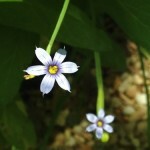 These tiny little flowers make a nice impact, but you really do have to stop and look. 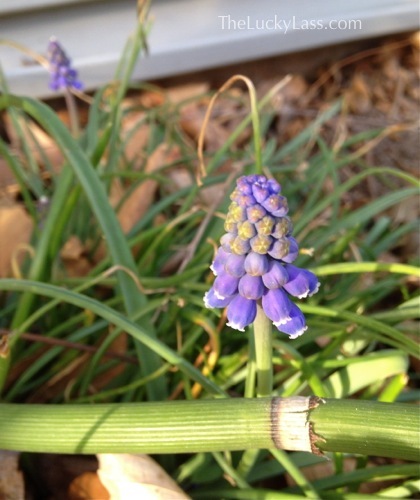 A couple of these little guys popped up- Grape Hyacinth. So cute, and so tiny. 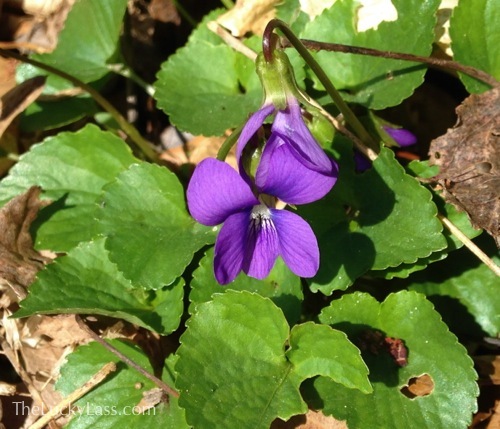 Another small, violet colored Spring ephemeral is the Viola. 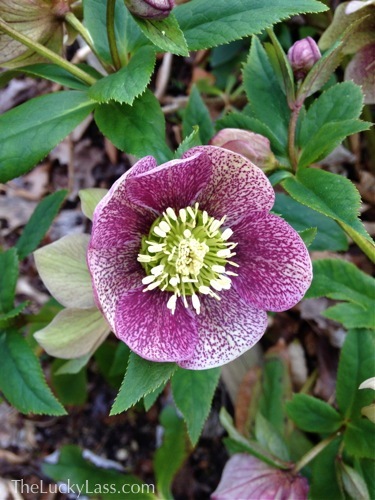 Of course the Hellebores are still going strong. Some of them have started looking ‘up’, meaning I don’t have to reach under or tilt the flower up for a good photo. 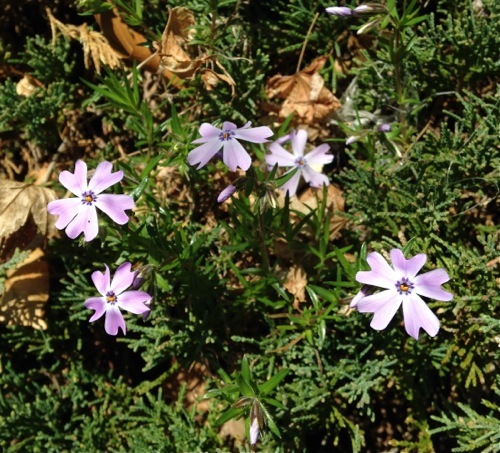 The creeping Phlox is just gearing up too. I remember growing up, my mom had planted Phlox out by the end of our driveway. 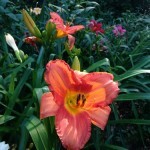 I remember loving to see it, as it was an early bloomer that created a carpet of color. 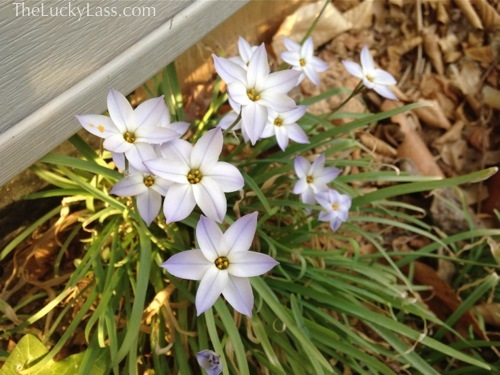 Spring Starflower also carpets the ground with color. More grass-like in appearance, these surprising flowers open up profusely. Around Richmond, there are lots of flowering trees. Right now many beautiful Cherry blossoms are everywhere. 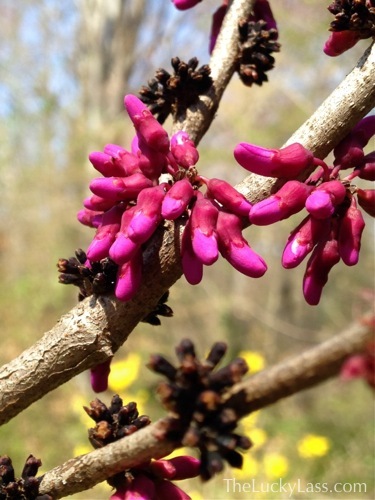 I don’t have any in my yard, but I do have a RedBud which is starting to show it’s buds. My tree is still somewhat immature so it’s still fairly small, but I’ve seen some Redbuds around that are just gigantic and covered in blooms. 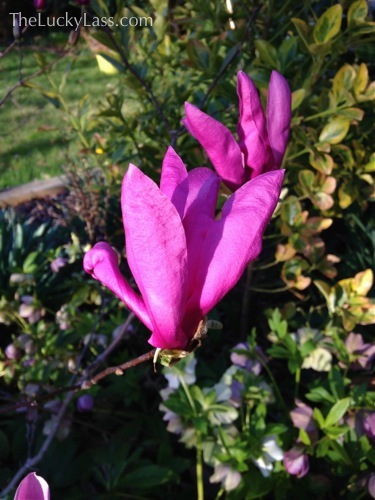 And finally, this Flowering Magnolia ‘Susan’. This tree is also somewhat small, but will not ever get very tall. The flowers are almost technicolor, I love it! 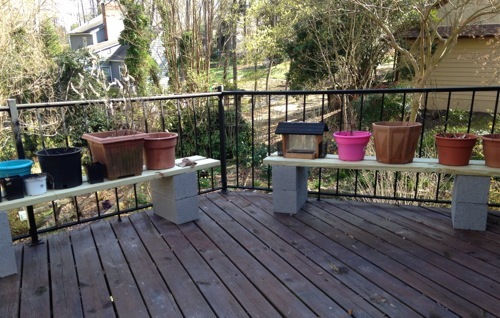 On the veggie gardening front this year- we’ve decided to do container gardening on the deck. We headed out to Home Depot and bought some cinder blocks and boards so we’d have a ‘raised bed’ effect as well as a way for the pots to drain without sitting directly on the decking. The pots pictured are not necessarily the ones we’ll use- I’ve got a bunch of different sized plastic pots stashed that should work for a variety of veggies. We still need to get compost and the actual plants- but we won’t be ready to plant for another month anyway. 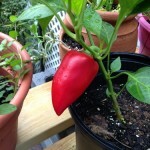 I’d love to know if YOU are growing vegetables this year! 1. 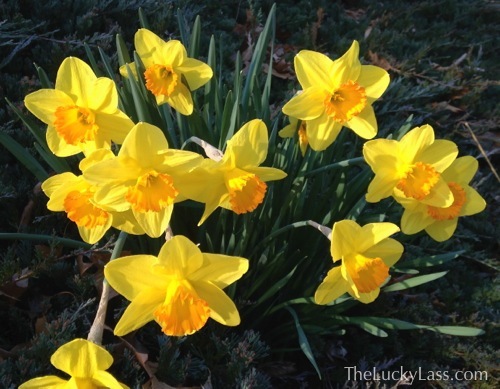 I LOVE all the photos of the different daffodils/narcissus! So beautiful! 2. 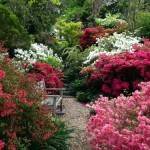 You have an absolutely stunning garden. Thank you for taking the time to share all of these photos. 3. The previous owner of your property would be so happy to know how much you are enjoying the garden they left, and how you are adding to it in such a thoughtful way. 4. Hurray for a vegetable garden! 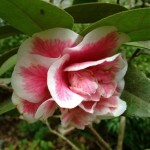 I’ll be planting one this year, but probably not ’til May. Have you read The Bountiful Container by McGee & Stuckey? It is a fantastic container gardening reference (and I even refer to it now that I’m mostly doing an in-ground garden). Thank you so much for your kind words Natalie! They mean a lot to me :) I have not read that book, but I will track it down! Thanks! !